Enforce proper letter formation by teaching age-appropriate writing skills, laying a foundation for lifetime penmanship skills. By using Scripture, poetry, words, phrases and sentences, students learn consistency through meaningful practice. Handwriting Grade 2 bridges the transition to cursive. BJU Press was formerly called Bob Jones; this resource is also known as Bob Jones Handwriting Grade 2 Homeschool Kit, 2nd Edition. Handwriting 2 begins by reviewing the pre-cursive alphabet, a form of printing that starts to form the letter in a way that leads to cursive, before moving into lessons that teach the actual cursive alphabet. Each letter is practiced by itself, and then a sentence is formed. Practice sentences are Bible verses, the pledge of allegiance and poetry. 94 perforated, non-reproducible pages with full color illustrations, softcover. 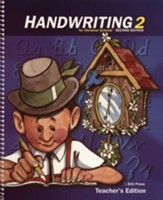 This resource is also known as Bob Jones Grade 2 Handwriting Student Worktext, 2nd Edition. This teacher's edition accompanies BJU Press' Handwriting Grade 2 Student Worktext. Step-by-step lesson instructions are provided, walking teachers through discussion, introductions, pre-tests, and the student worbook. Student pages are reproduced here. BJU Press was formerly called Bob Jones; this resource is also known as Bob Jones Handwriting Grade 2 Teacher's Edition.